Fibre 4 TV offer a full design, install and commissioning service of fibre optic and copper based permanent installations. Backed by 20 years of experience in the broadcast industry and a workshop of termination professionals, we can offer a full high-quality service at a competitive rate. "Get in contact today to see how we can help with your next installation!" Dimension Data commissioned Fibre 4 TV to install various inject points around the brand new, state of the art, training facility at Manchester City’s Etihad Campus. Linking the control room to both the remote points and the OB van parking point, they wanted hybrid camera cable terminated with the LEMO 3K connector for use during high-profile televised games. 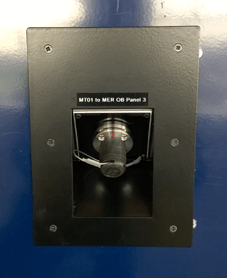 At the remote points, such as the players tunnel, goal gantry and pitch-side we used these custom LEMO plates and terminated the pre-installed hybrid cable directly to the connectors. At the multi-channel control room and OB park we pre-terminated the connectors coppers to terminal blocks in the trays and spliced on pig tails. Metro Ecosse had Fibre 4 TV complete their fibre install of the new Scottish Power Head Quarters up in Glasgow. Having pre-installed 4 core multimode around the complex, Fibre 4 TV were called in at short notice to fit Neutrik DUO connectors on the various inject points around the auditorium and other communication rooms. 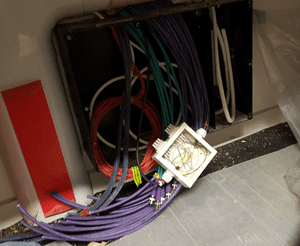 Having noticed the lack of space, and that the fibre would be the first thing terminated in an already congested box, we decided to splice into a 3” box with LC adaptors and test it from there. The AV guys tasked with completing the breakout boxes were then left with LC-LC patch leads to join our boxes to the Neutrik DUO connectors on the front plates. All 21 remote locations and the yet un-built control room had the fibre terminated and tested in 3 days, and in some very testing conditions! A partnership of BBC Music and Glastonbury Festival organisers commissioned Fibre 4 TV to install a permanent fibre back-bone around the Worthy Farm estate. Having the obvious complications of installing fibre cable on such a large scale it was decided to use Steel armoured fibre in a combination of 8, 12, 16 and 24 core singlemode fibre. Joining the OB compound with the various stages, such as the John Peel and the Pyramid Stage, the fibre was terminated to these green fibre cabinets to ST and FC/APC connectors for the any number of camera locations or broadcasters that might need to film at that location. Due to the ‘natural’ conditions that the cable lives in, Fibre 4 TV make an annual maintenance visit, pre-festival, to ensure that when the worlds eyes turn to Somerset, the fibre back-bone is ready to go.